STEP 2: Apply ground to pole 86. Last edited by Wilko16; 30-04-07 at 23:06. 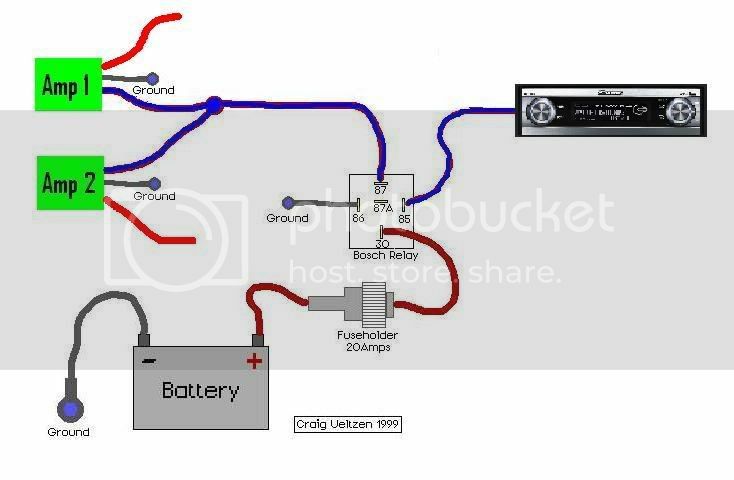 Why isnt the remote wire alone enough to turn on an amp? Doesnt the remote wire only turn the amp on when the headunit is active anyways... And its not like the amp draws power from the remote wire apart from activating its own internal relay. Thats why. If you only have one amp to controll, you probably dont need this! hi, just wanted to ask you a Q. i have one amp, is that suppose to be powered on all of the time even when the car is off? does it use alot of the battery? I used to run a mono block amp + a 4 channel amp and 2 capacitors off the one remote lead without any troubles. I will be doing this in my next car a good saftety measure just in case. Cheaper to set this up then to buy a new head unit. PIN 87 = constant power must be fused. can someone confirm this is correct, l checked everywhere on the NET and people say this is the correct way to do so? The reason l want to install a realy is so it solves the problem of the AMP staying "on" even when the ignition switch is turned to "OFF"
According to the picture can someone tell me where the POWER CABLES goes to AMP 1 and AMP 2? How would you connect it to the RELAY the wires are too THICK?? Would l need a whole new seperate power cable and fuse to run the releay with the remote wires or can l use my original power cables and fuse that is already installed from the amplifier? So what l'm trying to say is do l need to get a whole new kit? e.g fuse holder, relay and join this up seperately to the remote wire or do l use my old power wire and put the NEW relay & fuse in between the old power cable fuse and the amplifier? Hope it makes sense? Last edited by FRKVLT; 30-04-10 at 00:45. The red power cables should be connected to a battery with a fuse inline. They will not give power to the amps as the relay stops the switching wire from getting power till your ignition is on. LOL at putting an amp wire onto a relay. You connect pin 85 to the same wire your headunit triggers from ignition switch. But realistically you can just hook it up to wire that switches on when you turn the ignition on it doesnt have to be the same wire the headunit runs off. 30 you can just connect straight to the battery with a 20 amp fuse. & 86 to a paint free clean ground on the body / chassis. All this info is on the back of the relay packets. Last edited by jbonez; 30-04-10 at 13:45.
i dont get why the remote wire is in a relay.. WTF.. Its not like its any current flow.. its a trigger wire..
Last edited by [T]Matty; 01-05-10 at 00:53. Im pretty sure my trigger wire turns on 2 amps no worries without the use of a relay.